Katharine Parker ’92 has been appointed a federal magistrate judge for the United States District Court of the Southern District of New York. Parker, a partner in Proskauer Rose’s labor and employment department, will be sworn in on November 4 and begin hearing cases at the Daniel Patrick Moynihan Courthouse on November 7. The district’s board of judges appointed Parker to an eight-year term. 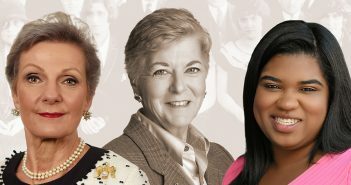 A desire to serve others—an ethos instilled in her during her time at Fordham Law School—motivated Parker to seek the bench after a successful career with Proskauer, where she chaired firm practice groups in employment law counseling and training, government regulatory relations and affirmative action, and hiring and background checks. Being a magistrate judge presents daily opportunities to help parties settle disputes while routinely engaging with various kinds of law, Parker explained when asked what excited her about the position. Throughout Parker’s career, she has committed her time and talents to pro bono cases, such as representing plaintiffs in civil rights suits. Along the way, she learned new areas of the law that will help her on the bench, she noted. Parker credited Fordham Law School for providing her a strong understanding of how to analyze the law, for teaching her to write clearly, and for introducing her to “examples of great legal minds contributing to our system” who inspired her to follow them. With her appointment, Parker joins a deep roster of Fordham Law School alumni who serve on the Southern District of New York bench as either magistrate or district judges. Hon. Henry Pitman ’78 also is magistrate judge in the Southern District of New York. The Southern District of New York’s district judges include Hon. Vincent Briccetti ’80, Hon. Loretta Preska ’73, Hon. Cathy Seibel ’85, and Hon. John F. Keenan ’54. In September, Hon. Kevin T. Duffy ’58 retired after serving for 44 years on the federal district court bench. Hon. Denny Chin ’78 served as a district judge in the Southern District of New York for more than 15 years before President Barack Obama appointed him in 2010 to his current position on the United States Court of Appeals for the Second Circuit.